I wish I could start this post with the cliché phrase “spring is here” and all that jazz. But folks, I’m afraid spring was here and it’s already almost past us. You know what that means, right? You’d better hurry up and stock on all you spring & summer essentials! 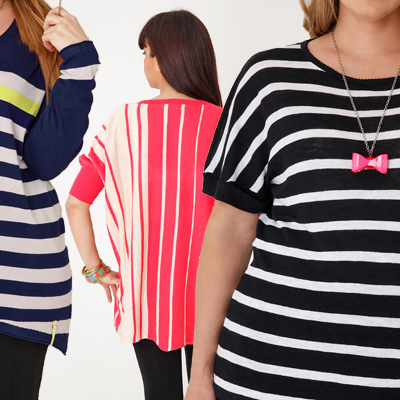 Stripes are in every season, but this time they’ve arrived with a blast! Moreover, you shouldn’t limit your choices to tops only. Try a striped cardigan, some stripy accessories, and why not, even a pair of striped pants. This is definitely the spring trend that will be going well into summer. The possibilities are endless: Wear a black top with white bottoms for a simple and chic look, try a cute b&w print like floral or polka dots, or combine two trends at once, by doing monochrome stripes. My personal favourite, ever since it came into style a few seasons back. Just imagine… Red pants worn with a turquoise blouse, a coral top together with a bright blue skirt, a lime yellow pair of capris and a grey t-shirt. Plus, it’s perfect for accessorizing, since it’s simple at its base. Oh, and don't forget. If you haven't "liked" XLcloset on Facebook yet, please do. They run the most amazing competitions all the time, like, this one right now where you can win €300 worth of clothes! And if that didn't convince you, I don't know what will!